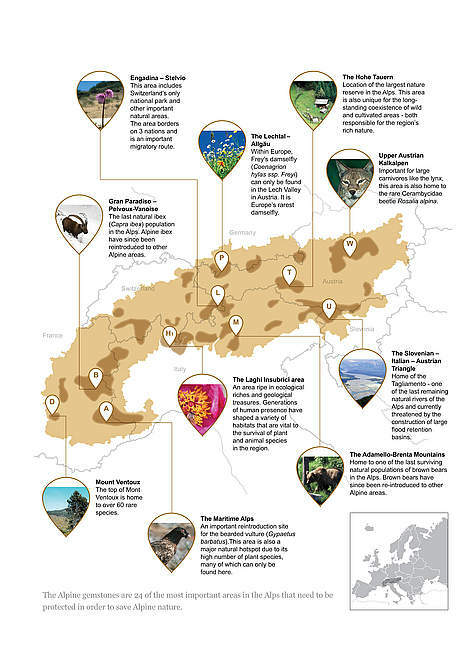 Together with its partners, the WWF European Alpine Programme (EALP) consulted top Alpine experts to outline the most important areas for the survival of the flora, mammals, birds, amphibians, reptiles, and insects of the Alpine region, as well as specific habitats such as the few remaining pristine freshwater basins. By overlaying the important zones for each of the ‘biodiversity elements’, 24 Priority Conservation Areas (PCAs) across the region were identified. These are the ‘gemstones’ of the Alps. For each of the 24 gemstone areas, the EALP and its partners are preparing an action plan for biodiversity. Click on the following links to learn more about the areas where WWF is currently most active. In the long term, a representative portion of Alpine biodiversity is maintained through WWF's work in Priority Conservation Areas - the Alpine gemstones. The Alpine gemstones are the key areas that need to be protected in order to save Alpine nature. That does not mean that the areas outside these gemstones are unimportant, but if we want to be most effective with our limited resources we have to concentrate our efforts on the areas that will have the biggest impact. 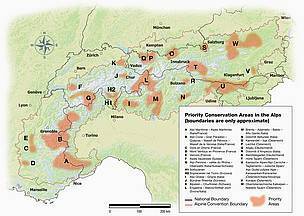 The WWF EALP is using this region as a pilot area to find the most effective conservation methods for conserving biodiversity in the Alpine gemstones. In addition to the development of a region-wide strategy, bottom-up conservation activities are being initiated by the WWF EALP and their local implementation partners in the Rhaetic Triangle area.